During the visit, Mr Clinton agreed that hardening the territory’s infrastructure will save both tax dollars and lives. “The taxpayers will save money, but it’s also the morally right thing to do,” said the former president during a meeting with territorial leaders, including Virgin Islands Congresswoman Stacey E. Plaskett and Senate President Myron D. Jackson. 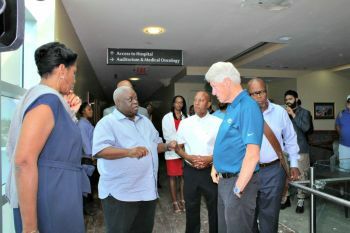 Governor Kenneth E. Mapp told Mr Clinton that the federal government had spent millions rebuilding the US Virgin Islands electrical grid and repairing public buildings in the past, only to have to spend money all over again when the territory was hit by yet another major storm, an observation the governor has reiterated on many occasions. The governor added that his administration was committed to rebuilding a smarter and stronger Virgin Islands, and that he had made the case to Congress to amend the Stafford Act to allow for infrastructure to be rebuilt to new standards. Mr Clinton, who is visiting the Caribbean this week on behalf of the Clinton Foundation, explained that he had learned rebuilding lessons with the Foundation’s work after Hurricane Katrina. The homes they helped rebuild in New Orleans were better-built and were much more energy efficient. The former president is visiting the US Virgin Islands and Dominica this week to assess Hurricane recovery efforts, which follows an announcement that the Clinton Foundation is launching a new programme called the Action Network on Post-Disaster Recovery, aimed at providing support for the USVI, Puerto Rico, Dominica and Antigua and Barbuda. The network, formed at the invitation of the leaders of Puerto Rico, the US Virgin Islands, Antigua & Barbuda, and Dominica, will formally convene its first open meeting on April 3, 2018 at the University of Miami. There, its members will consider commitments to action, building on the Clinton Global Initiative model that stresses mobilisation of resources to combat urgent global challenges. “Disaster areas often do not get the attention they need once the crisis has passed, Mr Clinton said said. “We want to be there for you once the headlines are about something else,” he offered. The Clinton Foundation Action Network is focusing on five areas of recovery in the Caribbean: energy, infrastructure, health, education and economic development. Mr. Clinton met Mr Mapp, Ms Plaskett and US Virgin Islands Senate President Jackson at the Schneider Regional Medical Center Monday morning for a private meeting and a tour of the damaged facilities, followed by a visit to the devastated Tutu High Rise Housing Community. They ended their day at Julius E. Sprauve School on St John, where Clinton and his team met with students, teachers and Education Commissioner Dr Sharon McCollum before holding a meeting with community members. The governor stressed that it was important to note that despite the severe damage to hospitals, employees had done a tremendous job protecting and caring for patients during and after the storms. Bill and Hillary have been to the USVI than the one time Obama’s came here. That’s nothing new. @ Bill and Hill. You are so right! They stole all of the money that was allotted for Haiti’s recovery to build housing, etc.. They really think we forgot? Why is he here anywY? We don’t want to see him....ever! The Haitian government is the biggest thief. @ @bones. LIAR! The USA. are the biggest thieves. Are you kidding me? USA is all over the world killing and taking whatever the hell they want to. SMFH at you.